I had written previously about our newest addition to our aquarium, a Scooter Dragonet, and promised to write further concerning his feeding. Dragonet’s are considered finicky eaters, preferring only live food, so to begin we purchased some Reef Pods to help increase the natural population in our tank. These pods can be found at a company called AlgaGen. Ideally, you would dump them in once the lights were out at night, so the fish wouldn’t eat them all, but we received them in the middle of the day, and because they are time sensitive, we decided to call AlgaGen to see how best to handle them. Not only did a real person pick up immediately when I called, they were amazingly helpful and knew about keeping a reef aquarium. You can find this product at AlgaGen.com. We ultimately decided to turn the lights out in the tank before dumping them in. Doing this tricks the fish into thinking that it is night time, and they all retreat to the rocks or their “beds”. 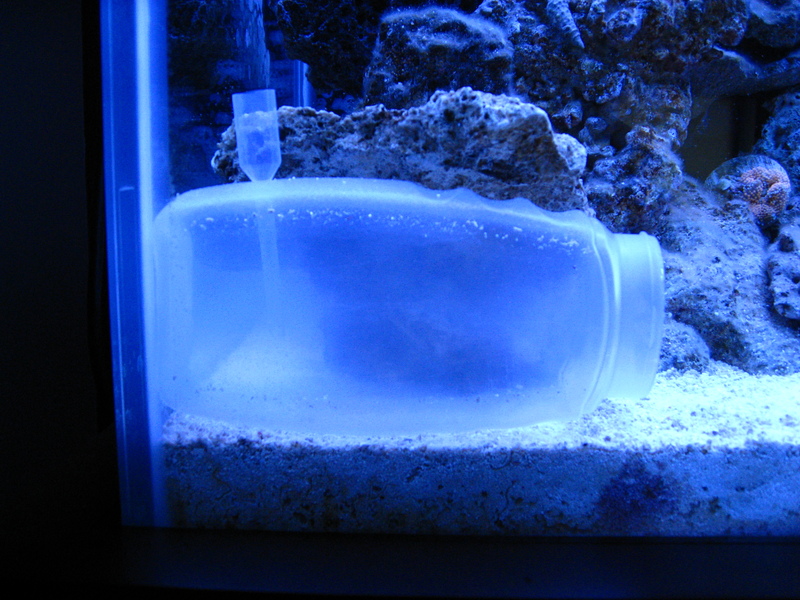 Once the fish were settled in, I dumped most of the bottle in the display tank. This allowed for the pods to have a chance at getting to the rocks and hiding before being detected by the fish. We added the rest of the bottle to the middle section of our sump where we have live rock and algae for them to hide and survive, and hopefully populate. Eventually they will get pumped from the sump into the display tank. It should also be said that only one type of fish that eats pods should be kept at a time so they do not compete for the same food source, unless, of course, you have a massive aquarium. To help wean our Dragonet from live food we also purchased some Brine Shrimp eggs (I remember them as Sea Monkey’s when I was a kid), found at our local pet store, while we train him to eat non-live food. 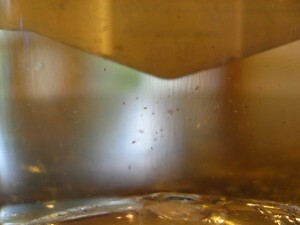 These brine shrimp come in a package or bottle. Each manufacturer’s instructions are a little different, but basically you add some eggs (a little goes a long way) into a salt mixture and let incubate and aerate for 24-48 hours. After that we keep them in the refrigerator, which helps keep them alive longer (roughly a week), and slows them down a little for the Dragonet. 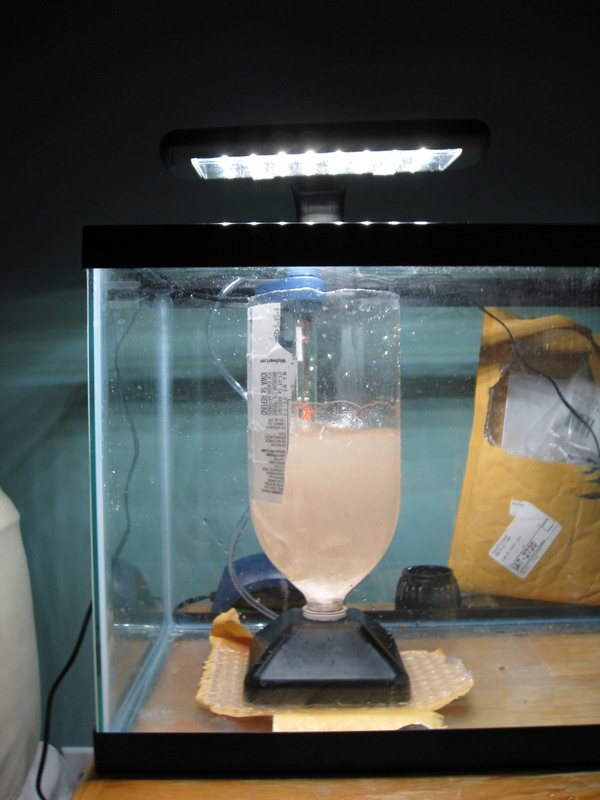 Our photo above shows a two liter bottle with the bottom cut off, screwed into an adapter with an aerator that we purchased as a “Brine Shrimp Kit”. There is a thermometer hanging on the bottle, and a light overhead. We placed the whole thing into an aquarium in case of an accident. Dragonet’s are also very slow, deliberate eaters, which makes them hard to feed when other fish are present, as they will not compete for food. To help with this we put a container in our aquarium for only him to go and eat. A turkey baster fits perfectly into the modified pipet, allowing us to squirt food into the container. This idea was mimicked from other ideas found on the internet. He learned very quickly that this is his place and visits it often, especially at feeding time. 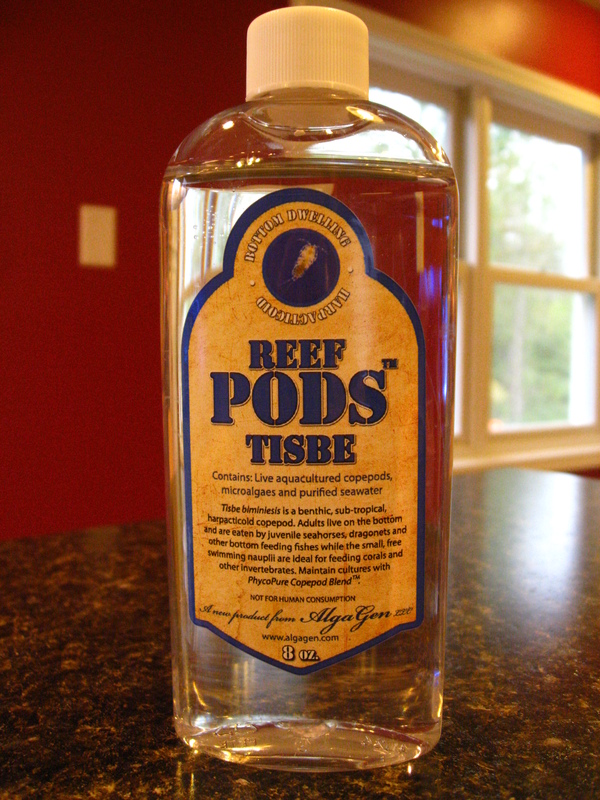 Because Brine Shrimp are not very nutritious, and because we need to wean him off of live food, we mix the Brine Shrimp with products such as Mysis Shrimp, Arcti Pods, and Tigger Pods from Reef Nutrition to see what he likes and doesn’t like. I have watched videos online of Dragonets eating pellet food, and yet have read forum after forum of other aquarists having no luck keeping Dragonets because they can not train them to eat non-live food. I think it is simple luck as to whether you happen to buy a less picky Dragonet. So far for us, our pod population is keeping him alive, as well as the Brine Shrimp. He also will eat Tigger Pods by Reef Nutrition (which is not a live food), but not much of anything else that I can tell. We will plan on purchasing more pods for our aquarium over the next few months, as well as continue to introduce him to other types of food to see if there is anything that triggers his appetite. This entry was posted in DIY Components, Informational and tagged AlgaGen, Brine Shrimp, feeding, pods, reef nutrition, Scooter Dragonet. Bookmark the permalink.